Absolutely The Very Best University of Washington Husky Football Tailgating Experience...EVER! Have you ever seen velvet ropes at a tailgate party? You have if you’ve been to The Dawg WagonTM. After years of tailgating on the back of an SUV with a tent, a few folding chairs, and a cooler a few ‘old dawgs’, fraternity brothers, and friends decided to make their dream tailgating experience a reality. The result is The Dawg Wagon. 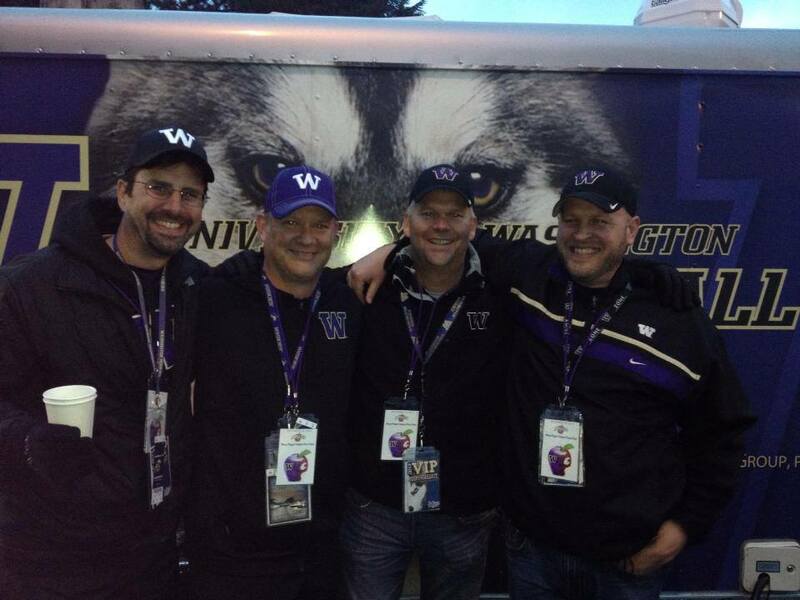 Officially launched during the 2013 University of Washington football season, The Dawg Wagon is collaboration between friends Chris Davis, Matt Mariani, Brian Pemberton and Rob Ihrig. Each of these friends contributed their own unique skills, talents and resources to create a tailgating experience which is legendary among the UW Husky Tailgating elite. Brian Pemberton, program director at Nokia, and Rob Ihrig, director of operations at Café Elite, have personally handcrafted the custom carpentry and lighting that gives The Dawg Wagon its beautiful yet functional interior. Matt Mariani, a principal at commercial foodservice company PCH Solutions, has chosen and installed the appliances and electronics that keep the cold beer flowing, the barbecue sizzling, and the college football games on the big screen. 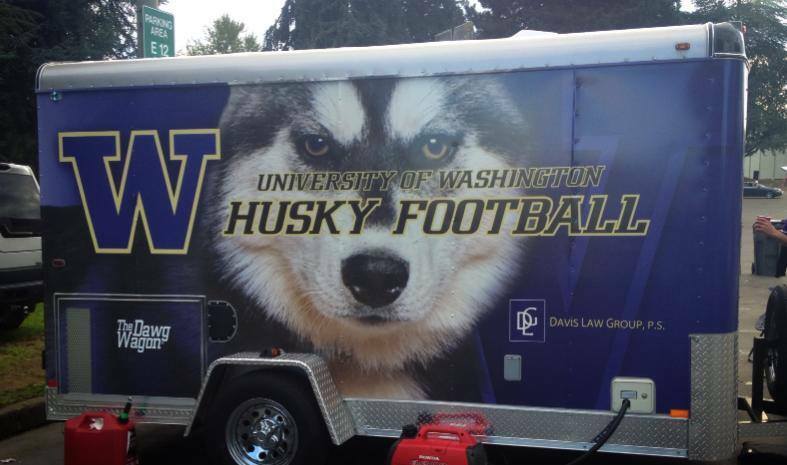 And Mischelle Davis, wife of attorney Chris Davis of Davis Law Group, created the custom graphics, signs, and décor that help make The Dawg Wagon stand out in the sea of tailgaters in the E12 parking lot at Husky Stadium. Purple velvet ropes with ‘private party’ signs line the perimeter of the party. And two large sandwich boards with the imposing figure of a husky guard dog also warn you that this party is for invited guests only. Tables covered with football field tablecloths welcome guests with barbecued meat, snacks and teats. Inside the generator-powered trailer there is a refrigerator and kegerator near the ig screen TV. 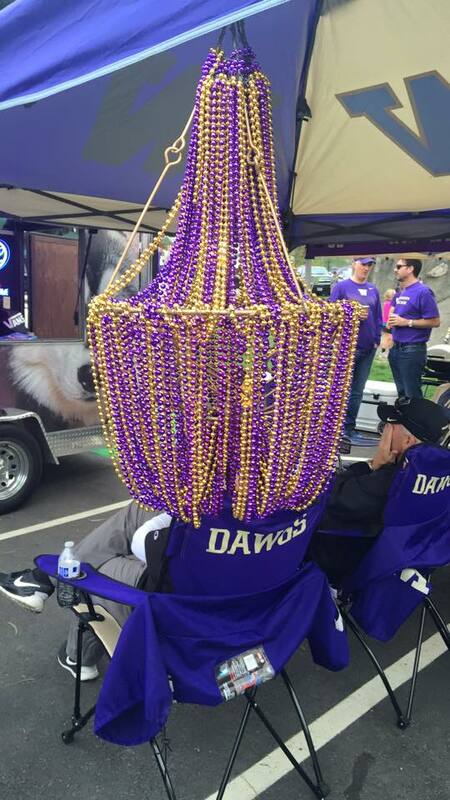 And from time-to-time Mischelle Davis may hang the purple and gold chandelier that is made from Mardi Gras beads. When visiting The Dawg Wagon you may notice a few signs reminding visitors that it is illegal to serve alcohol to anyone under the age of 21. Mischelle Davis is the chairman of the Washington State chapter of Mothers Against Drunk Driving (MADD). The entire crew encourages all Husky football fans over the age of 21 that attend any tailgating party and choose to drink alcohol to do so responsibility. Designate a sober driver; get a cab; use public transportation; or contact a friend or family member who can give you a ride and ensure that you get home safely without being a danger to yourself or others. It’s A Private Party – Where Is Your VIP Pass? The Dawg Wagon tailgate party at UW Husky home games is a private party for friends and invited guests. You’ll need a special VIP pass (no, we are not kidding) to get past the purple velvet ropes to hang out with The Dawg Wagon crew. A new VIP pass design is introduced for each season and for some special games. How do you get a Dawg Wagon VIP pass? If you know one of The Dawg Wagon owners you might be lucky enough to get an invitation and a VIP pass. The Dawg Wagon is always located in the E1 parking lot, typically near the climbing rock. To get a game day update on the position of the party check the official facebook page at https://www.facebook.com/dawgwagon/.